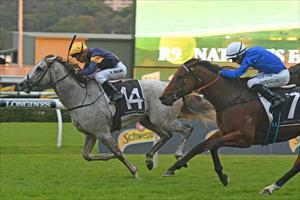 A good barrier made all the difference to Tribal Wisdom who scored a strong win at Randwick on Saturday. Able to settle behind the speed for Kerrin McEvoy, Tribal Wisdom was travelling sweetly approaching the home straight in the Nathan's Famous Hotdogs Handicap (1400m). The rail run appeared and Tribal Wisdom came through to strike the front inside the final 150m and have enough in hand to defeat the favourite Osborne Bulls by half a head. Mike Moroney said drawing a single figure barrier made all the difference to the four-year-old son of Makfi. “He’s done a very good job to win I think,” Moroney said. “I know he was well in at the weights but we had a little bit of a hiccup with him last week and he missed a gallop. “His blood was good at the start of the week and he was good to go and with the race over 1400m I was confident he would run well. “He had a good draw for once and he got a terrific ride from Kerrin McEvoy so it all came right on the day. Moroney said he is considering sending Tribal Wisdom to the Brisbane Winter carnival. “His racing manners have really improved, he can relax behind horses which he hasn’t always done and it’s a good sign for the future,” Moroney said. “The plan has always been the Stradbroke and if he struck a wet track then that will not be a problem.